Heat vegetable oil on a small frying pan over medium heat. Place peppers in frying pan and fry on each side till burned all the way around. Remove the peppers from the pan and allow to cool on a cutting board. Cut the stems off and toss the peppers in the blender. Discard stems. Add the remaining ingredients into the blender and blend until creamy. The beer will make this guacamole fluffy, creamy, and a little on the thick side. It will almost be like a mousse. Serve in a bowl with chips or drizzle over your favorite food. Enjoy! When blending the ingredients, make sure to stop the blender and mix the ingredients with a spoon so the blades get to chop evenly. When you blend avocado, it tends to remain at the bottom of the blender and not reach the top. I enjoy summer evenings on my patio with a cold drink and a nice snack. Depending on my mood and what we have in the house, my snacks vary. Sometimes I eat salsa and chips or cheese and crackers, but if there are avocados on hand you can bet your bottom dollar I will be making guacamole. I love guacamole and make all different types. Why stick to the same chunky avocado dip when you can have so many different variations? 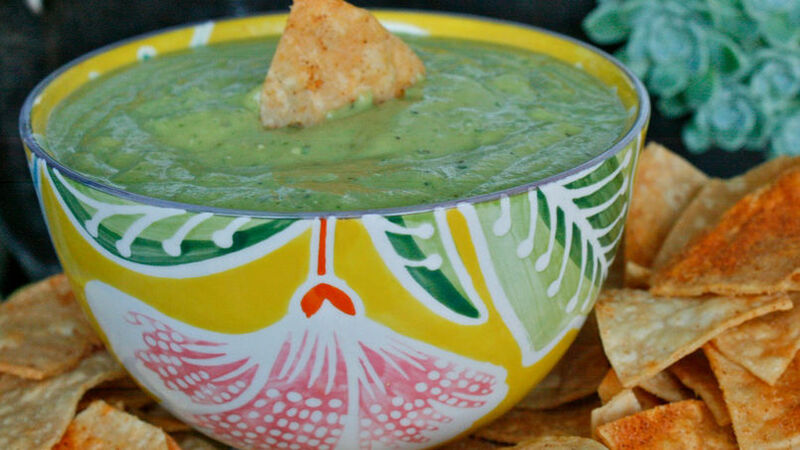 I remember my aunt use to add sour cream to hers when I was a kid, and my grandmother used to add a touch of salsa to the green avocado smash she whipped up. I do all of the above and sometimes I hit a recipe out of the park. This Mexican beer guacamole is a winner with my family and I am glad to pass it on to you. Enjoy!